2013 will see the 70th anniversary of the founding of 617 Squadron and the Dams Raid, and a number of events are being lined up to commemorate it. Those organised by the 617 Squadron Association have still to be confirmed, but they are likely to include a tribute by the Battle of Britain Memorial Flight Lancaster at Derwent Water reservoir in Derbyshire, one of the UK reservoirs used by the Dambusters for training in the run up to the raid. This is provisionally scheduled for Thursday 16 May, the anniversary of the raid itself. Derwent reservoir was the scene of a Lancaster flyover at the Ladybower Dam on the 65th anniversary in 2008, shown here in a terrific panoramic photograph by Rob McPherson. There are also likely to be events at both RAF Scampton and RAF Coningsby, and the laying of a wreath at the 617 Squadron memorial in Woodhall Spa. 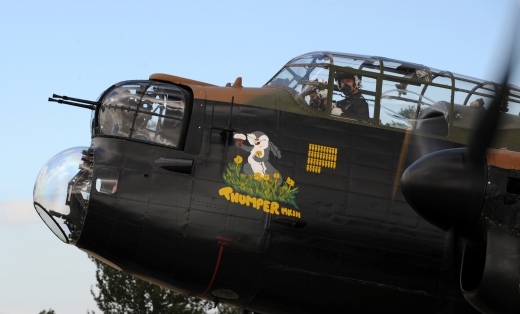 The BBMF’s Lancaster, PA474, has already been given a new nose art and identity to mark the 70th anniversary of the founding of 617 Squadron. It is now to be called DV385, Thumper Mark III, to match the identity of one of the Lancasters posted to the squadron in November 1943, to replace those lost on both the Dams Raid and the disastrous September attack on the Dortmund Ems Canal. 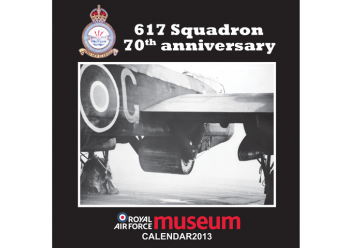 And further celebration of the anniversary comes from the RAF Museum, who have published their must-have Christmas present in the shape of a 2013 calendar. More information on 2013 events will be posted here as soon as we get it.